1 Learn how to Increase Website Traffic Free. 1.0.1 How to increase website traffic? What is it? 2.2.1 That’s it! How do you increase website traffic? Learn how to Increase Website Traffic Free. WWW is filled with tips about increasing page rank and Increase Website Traffic. How to increase website traffic? What is it? It refers to the number of people who view your blog more or less often. It should be called “The Mother of Blogging” because if you have no traffic in blogging, you are nothing in blogging, just as a mother is important for a baby. Without wasting more time I will be going straight forward share tips to increase website traffic. These tips will surely help you to increase your traffic in upcoming year as well! Social Media Strategy is the Major Weapon in success of a blog. If you build right Social Media Strategy and use it at right times and right places, you could certainly be in the Winners. Post more and more engaging stuff. Stuff that call the people to comment more and more and like your posts more and more. Create your presence in all major Social Media websites and link your blog to them. Must include social media sharing buttons to your blog posts and main blog page. Share your new posts regularly on Social Media websites. Don’t just share new posts, but also give at least one hour a week to organize your older posts and share them to Social Media. Try to build more audience on Social Media. Use browser extensions or other SEO tools to save your time while sharing on Social Media. Give your 40% available time to Social Media sharing and Social Media audience building. It’s important and in this way you can increase website traffic within very less time. Another one of the most essential ways to Increase Website Traffic is related to your blog content. Regular posting assures your continuous presence on the blogosphere which results in good search engine linking and higher PRs and Quality Posting assures your loyal visitors. Loyal visitors are those visitors, who after visiting your blog once, find it useful and Bookmark it to visit it later. These visitors are the much needed asset for the success of a blog. There are many methods of increasing loyal visitors, I will post them in a later post. Many new Bloggers, (including me too when I was very new) wasted their precious time in judging there Alexa Rank and Google Page Rank. This is the first step of disaster for a Blogger. If you follow the same pattern, you should overlook it as soon as possible. No blog can get Alexa Rank of 1000 within a month nor a Page Rank of 6 within a month. Just keep these things aside and Focus on QUALITY of your content and REGULARITY of your content. Its simple! Just stick to the basics. Don’t try to be over smart. Analyze some successful blogs and see their writing and presenting methods. Try to furnish your writing skills. Never ignore Social Media integration. As it is the biggest secondary too to increase website traffic, it is atraffic generation tool. It is nice to see our blog getting more and more increased in Alexa Rankings but what you need is “Traffic” which could only be generated by sticking to the basics. Focus more to Increase Website Traffic and When you get traffic, you’ll automatically get higher Alexa Rank and Google Page Rank. Top 15 Killer Tips To Increase Page Rank! It is very important, as Blogosphere community is a great source to Increase Website Traffic. Retweeting some Tweets of top ranking / high follower bloggers, it might also make them to Retweet your tweets too. Making strong presence in all major social media websites. Tweet different good articles from different blogs giving “via @BlogOwner” link. Try to make personal contacts with some of the leading bloggers, so that they may share their experiences with you. Nice presentation of blog design and faster loading are the two factors which assure the number of loyal visitors to your blog. If your blog has a scary look and navigation is difficult, your visitors will start neglecting your website even if it appeared in Google search page one. If you want your visitors to visit again and again, then you will have to choose a simple and easily navigatable design for your blog. It’ll surely help you to boost traffic and also increase website traffic with ease. Pageload determines the time in which your page loads completely. It also needs to be good if you want your blog to be visited by a visitor every now and then and thus create loyal readers. Pingdom Pageload Checker is a very good tool for Pageload information. It completely analyzes the performance of your blog and lets you measure each and every aspect of your blog/website. It is really a tool worth trying. Another way to increase website traffic is to add Social Media Sharing buttons allow your visitors, as well as you to share your stuff on Social Media. These buttons are added to many blogs. But the correct placement of the buttons is what matters. Try to add the buttons on the eye-catching spots. For example just at the end of post. The reader who reads till the end will surely like to share it to others. A strong mailing list has always been an ingredient for a successful blog. Mailing lists are a major source of assuring continuous traffic and they will surely help us to Increase Website Traffic. A person reads your blog post, likes it and wants to get updated from your blog. No worries mate! Offer him something to do by adding a nice gadget for Email Subscription in well-optimized place. That’s it! How do you increase website traffic? 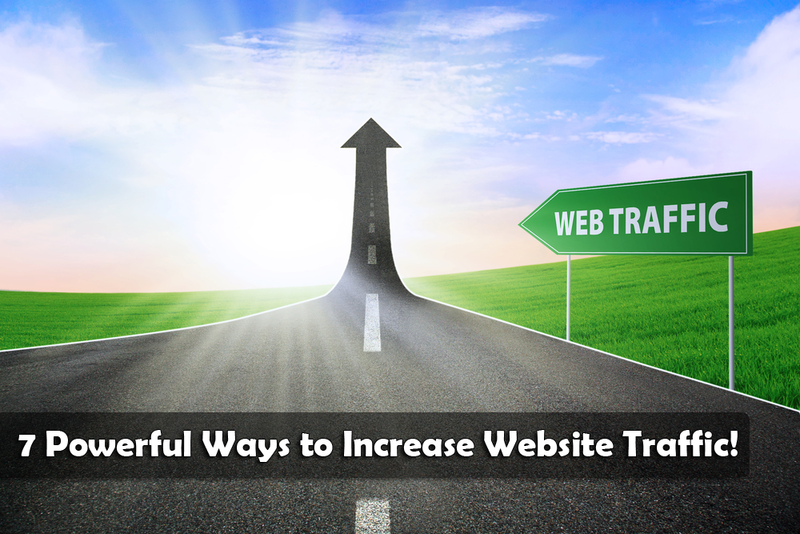 These were the 7 Powerful Ways to Increase Website Traffic in 2013. So it is a very DENSE EXTRACT and might well help you. And I am sure these tips really gonna help you in the next upcoming year 2013 if you implement them rightly. If you disagree with any of my point to Increase Website Traffic or want to improve myself, your suggestions are most welcome. I will never dislike your comments (even critical ones) but please be ethical! 8 Most Important Points To Get More Traffic & Leads For Your Websites. I am browsing online more than Three hours these days, having said that i never ever found every interesting article like the one you have seo basics. It truly is pretty value enough in my situation. Personally, in the event that many website owners as well as blog writers manufactured perfectly articles while you in all probability performed, the net shall be much more practical than in the past. Somebody essentially make severely content I’d personally declare.. pc sms bulk sender That’s the beginer I been to internet website and for that reason much? I stunned with the analysis you made to create this actual submit remarkable. Wonderful employment! Howdy my pal! I would like to state that pros and cons astounding, excellent created and include almost all critical infos.. bulk sms provider in india Let me glimpse much more threads this way . Hello, Welcome to Blogging Helps. This Blog is mainly focus on Blogging tips, SEO Tips, Digital Marketing, Starting of Blog on Blogspot and more. Take your blog from Zero to Hero. It also includes tips on Make money online. You will loved to Explore Blogging Stuffs on our Blog. © 2019 Blogging Helps. All rights reserved.